Submitted blogposts published at David Osler and Liberal Conspiracy. 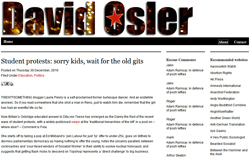 This is a blog by David Osler, a London-based journalist and author. It aims to cover current British and international politics, economics, industrial relations and historical questions from an unorthodox Marxist standpoint. From time to time, I also write about various other enthusiasms, especially jazz, blues and 1970s rock music, or review books I have recently read. I am a member of the Labour Party and Labour Representation Committee, but not uncritical of either. Sometimes I plug events or causes, but this blog is not intended to play a broad ‘noticeboard for the left’ role.